In this story Nira Harel shows us that resourcefulness and determination are not necessarily confined to adults. Little Dudi is faced with quite a challenge, but he shows great originality in solving his problem. Father Shlomo and Mother Dina are about to go shopping. Dudi is going to stay home and mind his baby sister, Tali. Rexi, his dog, will keep him company. Before Father and Mother depart, they give little Dudi some important instructions: “If Tali cries, give her a pacifier.” And Father adds, “If anyone calls, tell them we’ll be back soon.” Dudi plays with his toy fire-engine and all is quiet. Suddenly the telephone rings. A female voice asks to speak with Dina. Dudi replies that she isn’t home. “Can I leave a message?” the voice inquires. “Yes, you can,” replies Dudi. “Then tell her she has a dentist’s appointment at 7, all right?” “All right,” says Dudi and hangs up. Dudi realizes that the way to remember a message is by writing it down. But how do you write down a message if you don’t know how to write? Dudi soon develops his own method of recording messages: he draws a picture of a woman – because it was a woman who left the message. He makes her mouth open – because everybody opens their mouth at the dentist’s. And he draws seven teeth in her mouth – that’s because the appointment is for 7 o’clock. When another person calls and asks to leave a message, Dudi has his crayons ready. Mr. Wolf asks to tell Father that he will come over that evening. 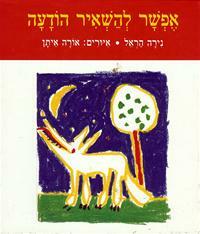 “Now don’t forget,” warns Mr. Wolf, “It’s very important.” Dudi decides that this is a very easy message to record: he draws a picture of a wolf (it looks a bit like a dog, but only a little). Now, where does the wolf come from at night? From the forest, of course. So Dudi sketches in a forest and darkness all around. Now Dudi knows he won’t forget the important message for Father. When Dudi’s parents return and he proudly shows them his picture messages, they are so impressed that they draw him a picture message in return. Can you guess what they drew?